The big winners in the three-month period ending in February in terms of smartphone share globally and in the U.S. were Android and Windows Phone, according to Kantar Worldpanel, with BlackBerry experiencing significant declines in consumer interest and iOS remaining fairly level in most markets. The bad news for BlackBerry is that it saw its smartphone OS share decline even in the U.K., where it launched BB10 and its new hardware at the end of January. Windows Phone isn’t really posing a threat to iOS or Android, which continue to dominate smartphone share is all markets, but it is starting to pull away from BlackBerry and Symbian when it comes to making a strong showing as a third place contender. In the U.S., Windows accounted for 4.1 percent of smartphone sales in the three-month period ending February 2013, up from 2.7 percent for the year-ago quarter. BlackBerry, by contrast, represented only 0.7 percent of smartphone sales in the U.S. according to Kantar, down from 3.6 percent during the same time in 2012. In the U.K., BlackBerry slid from 16.8 percent of all smartphone sales in the three-month period ending in February last year, to just 5.1 percent of sales for the same span in 2013. That’s a drop of 11.u7 percentage points, during a period that included a full month of BB10 device sales. BlackBerry itself claimed 1 million devices shipped for its most recent fiscal quarter, which included BB10 launches in Canada and the U.K., but when pressed about how much of that represented actual sales, execs hedged and noted that it was “sort of” closer to between two-thirds and three-quarters of that 1 million figure on its investor conference call. Android’s performance has likewise been strong, with big increases in many markets, including Great Britain, Germany, and Mexico. 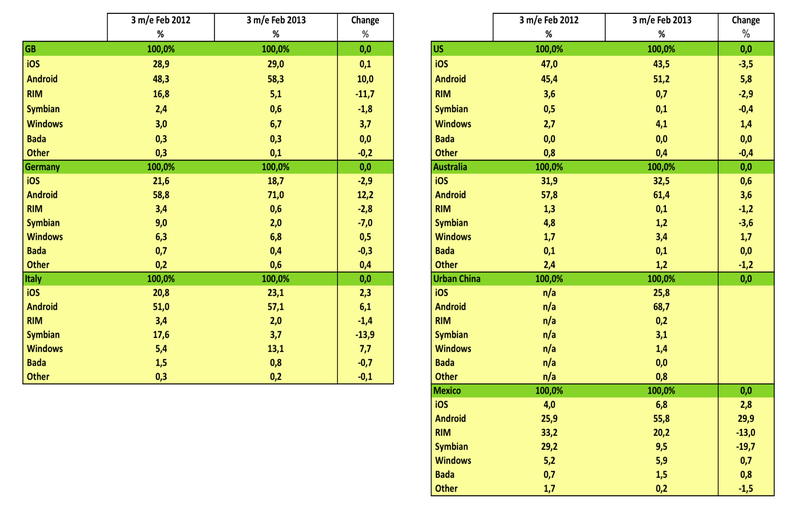 And while iOS remains relatively stable, with either small slides or gains across the board, it isn’t losing significant ground to the competition in any market: Android is eating space given up by legacy players like Symbian, which in most cases is dropping share quicker than BlackBerry. BlackBerry has the most to lose, however, since Symbian is no longer being actively developed. We’ll see if the gradual worldwide rollout of BB10 can reverse some of the losses being reported by Kantar in the coming months.